I’m happy to say there’s some great news for those of you who regularly use professional cable locating technicians. And, actually, for those of you who don’t regularly use locating technicians—but have in the past or will in the future—then this news is probably even more relevant to you. Dial Before You Dig have begun testing and assessing ‘professional cable locating technicians’ to make sure they meet a minimum standard that is required to be able to offer you safe and professional services as a cable locator. Only those who pass the rigid test will gain certification and will then become a ‘Dial Before You Dig certified locator’. Those locators who pass the test will be listed on the DBYD website so that customers who need a locating technician onsite will now have just one place to look to find a locator that they know they can trust and rely on to have the experience and knowledge to get their job done right. OK, so let me give you a bit of a back story about where we’ve been and how we’ve come to this stage from my perspective. And before I do, to just put it into a bit of context, I grew up with a father who worked for Telstra for 20 years and was one of, if not the very last full-time cable locator; then starting our own cable locating business being ‘Geelong Cable Locations’; and now running the company myself, as well as being heavily involved in NULCA (the National Underground Locating Contractors Association) for many years and also being a member of Dial Before You Dig. So I’m pretty confident that I can give a true perspective to where we have been and how we have got to this stage. I’ve seen the industry go from something that everyone said wouldn’t work—“No one will pay a private company to locate underground services…”—and would never last to now becoming a full industry of its own. However, in that same period of time, it’s gone from just a handful of guys that were serious about the work they perform to a market saturated with locators. Now, Telstra—having more underground assets than anyone else—really felt the effect of this more than most. There were still hundreds, if not thousands, of Telstra cables being hit. And a lot of the time when they arrived to assess the situation, the excavator operator or the construction manager would say that they did actually hire a “professional” locator to come out to site and locate the Telstra for them. Now keep in mind that Telstra already had a system in place to train locators on how to read Telstra plans and locate their cables, as well as to work safely around Telstra assets. 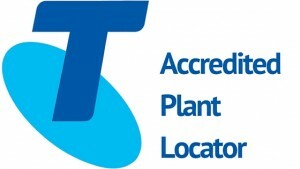 So even back then, technically speaking, in order to access a Telstra pit and locate the cable, you had to have done the Telstra course and become what is known as an APL (Accredited Plant Locator). In 2009 Telstra decided to re-do the course, put in new rules and re-test all the locators out there. The idea was that those who were not serious about cable locating would leave the industry—and only those that were serious would stay. There was a lot of backlash in the industry initially—as there always is with change. But after a while it was accepted that this was the new way it was to be. Unfortunately, however, the new system never really worked that well and didn’t achieve its goal. There were still locators out there who were unskilled and uninterested in improving their skills in anyway, services were still being damaged and, if anything, the list of locators who were Telstra accredited grew longer than ever. So this is where Dial Before You Dig have now stepped in. DBYD have known about this issue for a while and have always been looking for a way to try and help its members get fewer hits on their underground services—and also help its customers who use Dial Before You Dig to know who they can call to help them locate where everything is when they are onsite. Dial Before You Dig Queensland have been at the forefront of this and have been working closely with NULCA to try and come up with a way to test and assess locating technicians to make sure they have at least the minimum levels of knowledge, skill and experience required to be able to perform a professional locating job for a customer. It’s taken some time, but they’ve finally got there. Now, I’ll admit, it still isn’t perfect and I think it does have areas it can improve on. But it’s better than anything that’s been out there so far. And after sitting the test myself—and passing it!—I’m quite confident that you won’t be able to pass the test unless you’ve completed some form of formal locator training. Telstra have also already adopted the new assessment. So now in order to become an APL and be able to locate underground Telstra cables, you need to have passed the DBYD certification. What does DBYD certification involve? Well, to become DBYD certified you first need to sit an online assessment. It’s made up of a series of multiple choice questions that only those with a good understanding of locating would be able to pass. Once you’ve passed the online assessment, a practical exam then takes place—again answering a series of questions out onsite as well as running through several real-life locating scenarios. Really, why does any of this matter to you? In my opinion the biggest winners out of all of this aren’t DBYD who will now be earning more money from fees. Nor are they the utility providers who’ll have fewer assets damaged because they are being located correctly. It isn’t even me—who was the very first person in Victoria to become Dial Before You Dig certified. No, in my opinion the biggest winners out of all of this are the customers who use professional cable locating companies. I actually feel sorry for those of you who use locators because I reckon it must be so difficult. They say to run a successful business you need to put yourself in your customers’ shoes and look at it from their side of the fence. Well, if I stand on your side of the fence and have to choose which locating company I would pick to come out and do a job for you—without knowing what I do about the industry—I would really struggle. How on earth are you meant to know the good locators from the bad? Do you pick the one that is number 1 in Google? Do you pick the one that has the best website? Do you pick the one that sounds like he knows what he is talking about over the phone? Do you pick the cheapest? Do you pick the dearest…? You need to hire someone to come out and tell you where all the underground cables and pipes are so that you don’t hit anything because you know if you do, it could end up costing you a small fortune. Or you could get hurt—or even worse. So you have to make sure you’re getting someone who knows what they are doing. But how do you know? Well, this is why I think you—the hiring customers—are the biggest winners of this new certification. You’ll now have a single point of reference to access a list of locators who you can call on, safe in the knowledge that they’ve passed the DBYD certification and at the very least they have attained a minimum standard for locating. Another issue a lot of customers have is that they are used to dealing with the owner of the business or one locator in particular within the company—but then all of a sudden on a new job they will get a different technician, but still with the same locating company. The issue they then have is knowing whether the technician that is onsite today is qualified and experienced, or has he just started in the industry and hasn’t had any training as yet. Unfortunately, there are some locating companies that will put guys out in the field on their own before they are ready to take on the responsibility that this job entails. So another advantage of this new certification is that it is given to the locating technician—and not to the locating company. So you will be able to tell if the particular technician who turns up to site is actually qualified to do the task you are asking them to do for you. As I’ve already mentioned, the test can still improve and no doubt it will have alterations done to it. I also suspect that, because DBYD have created it, other asset owners will come on board as well—just like Telstra have. They may add other elements to the test or modules that you need to pass, but whatever happens, I can only see all of this as an improvement that will help the industry and help you, the customer, as well. The DBYD locator certification is a good thing for all. In fact, moving forward, I can see the DBYD certified locator card being a standard request to be shown when arriving at a site, much like your red/white industry induction card are.